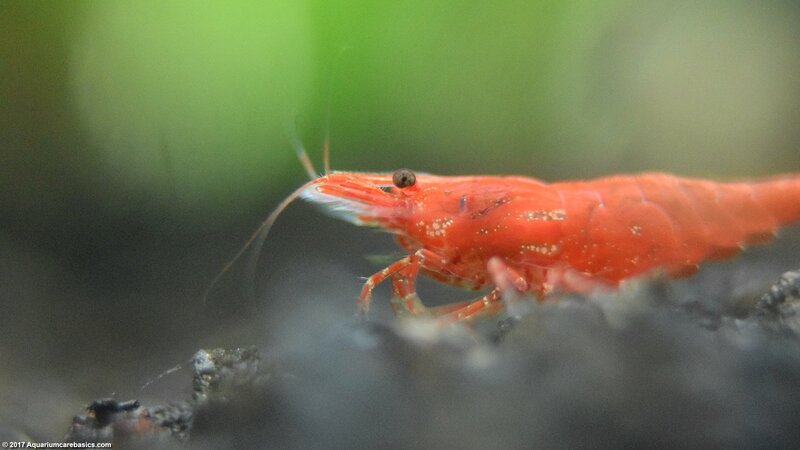 A Red Cherry Shrimp can be a great little freshwater shrimp to add to an aquarium. Their bright red color really adds beauty to a tank, especially one loaded with live green aquarium plants and black gravel or substrate. Cherry Shrimp or Neocaridina heteropoda, also known simply as Cherry Shrimp, are natives of Taiwan. But most available in stores today are bread in captivity as they can reproduce in fresh water. 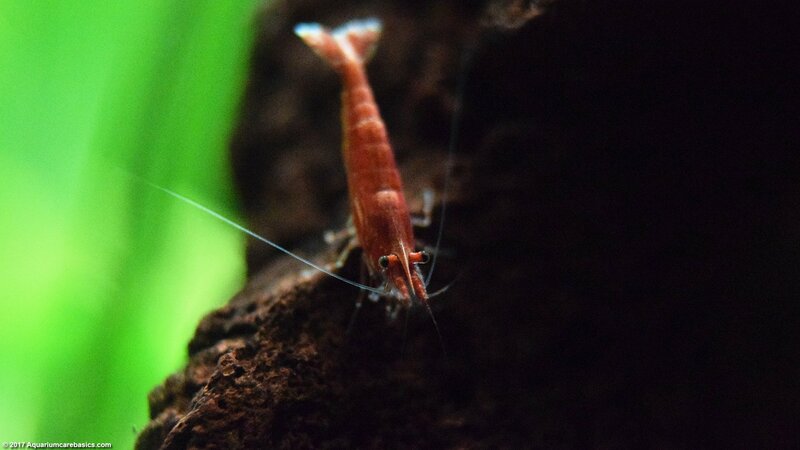 Red Cherry Shrimp are active and interesting to watch. 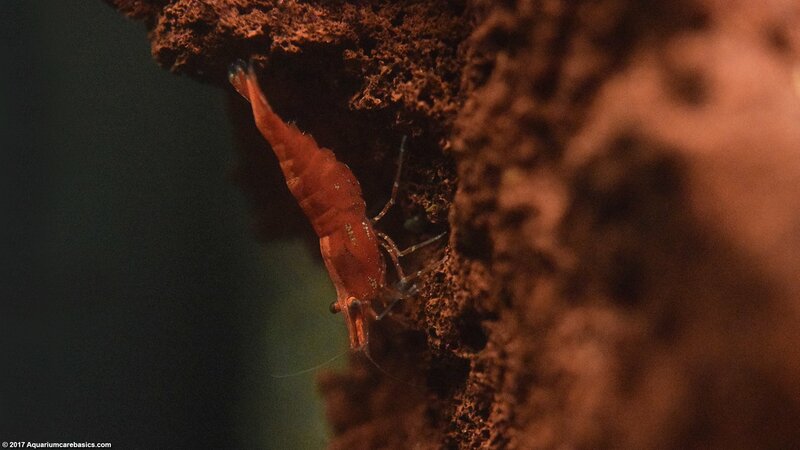 Here is an HD video of a Red Cherry Shrimp feeding in a planted aquarium. 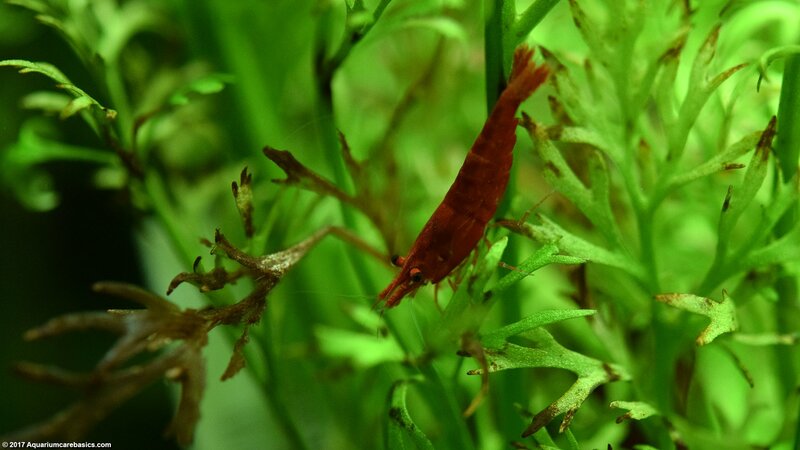 Red Cherry Shrimp seem to be comfortable in established aquarium water that is on the hard side, with a decent flowing current. The key is to keep water conditions stable, and avoid ammonia spikes, high nitrites, high nitrates. 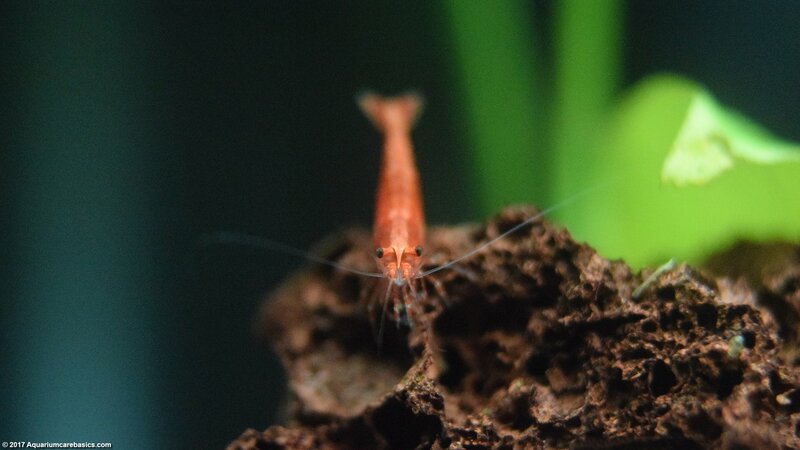 Also be careful when using medications and most importantly avoid copper because it can be fatal to aquarium shrimp. 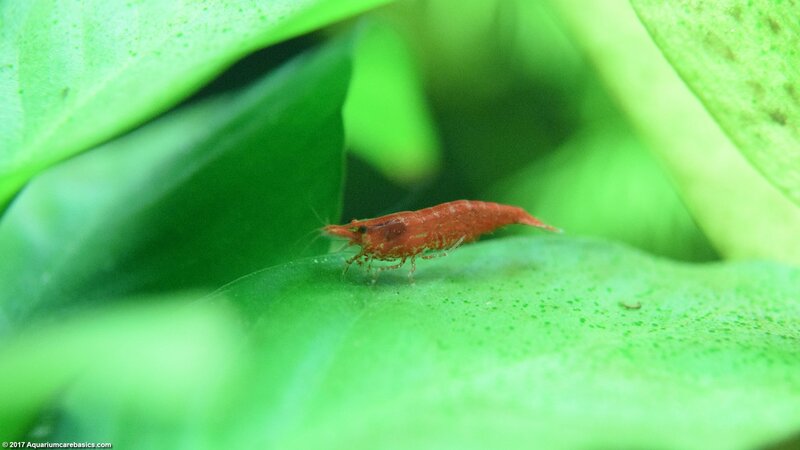 Red Cherry Shrimp lifespan is about a year, or a little longer if tank conditions are right. That said, they can die soon after being added to a tank…possibly related to stress caused from shifting water conditions, or stress from being transported. 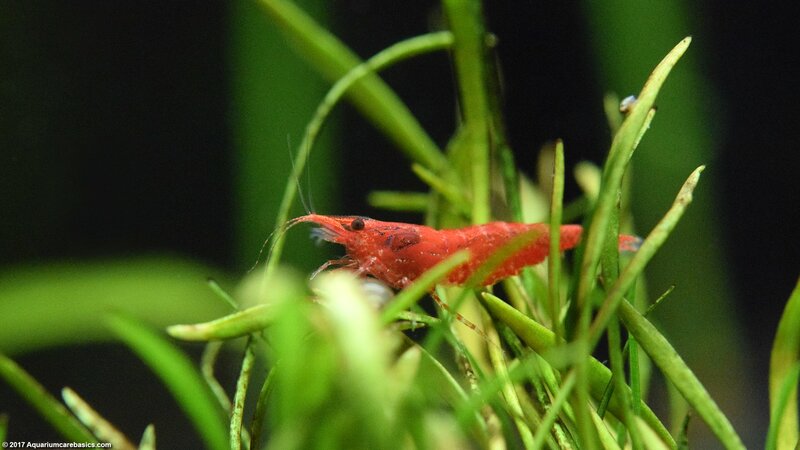 Red Cherry Shrimp feeding is not difficult at all. Their diet includes commercial food like fish flakes, shrimp pellets, fish pellets, and algae wafers. 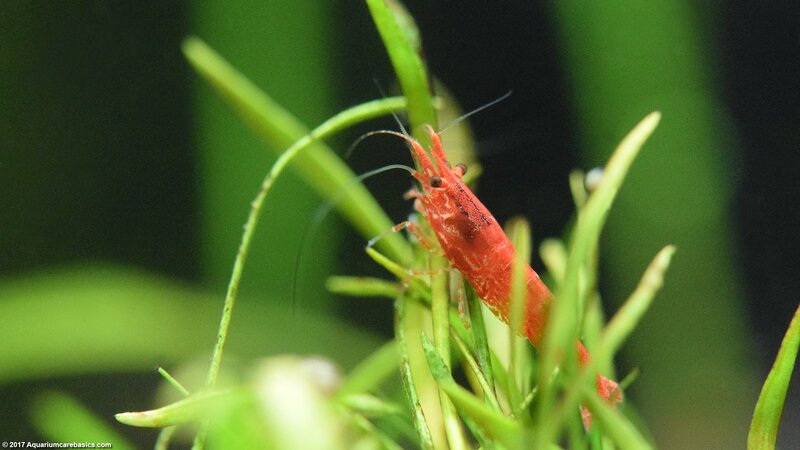 Red Cherry Shrimp diet can also include edible plant matter shed from live aquarium plants. 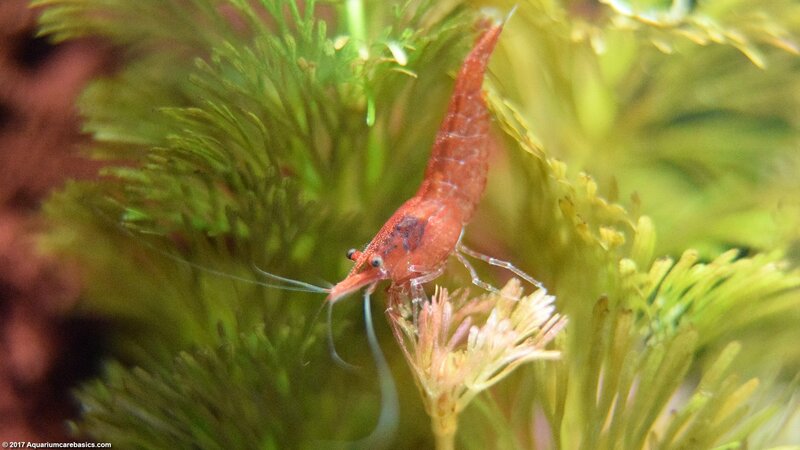 Cherry Shrimp are also algae eaters, feeding on forms of soft green or brown algae that grow on hard surfaces, and soft bio-film algae as well. 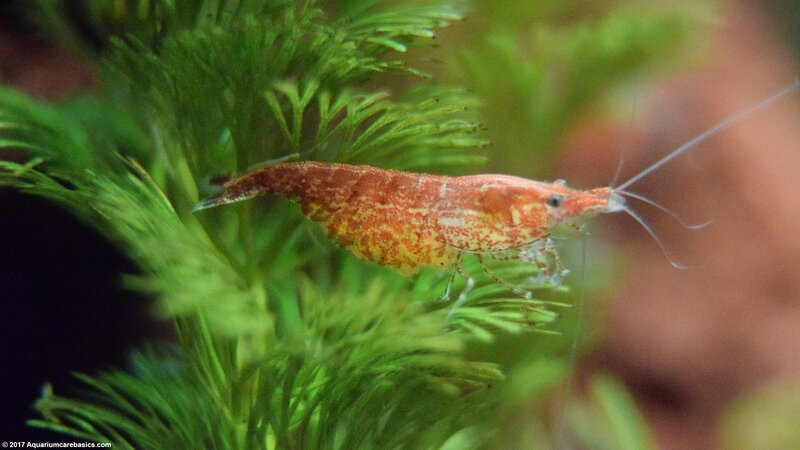 As algae eaters, Cherry Shrimp will actually be able to stand on soft green or brown algae that has grown on the side glass of a tank and feed off it. 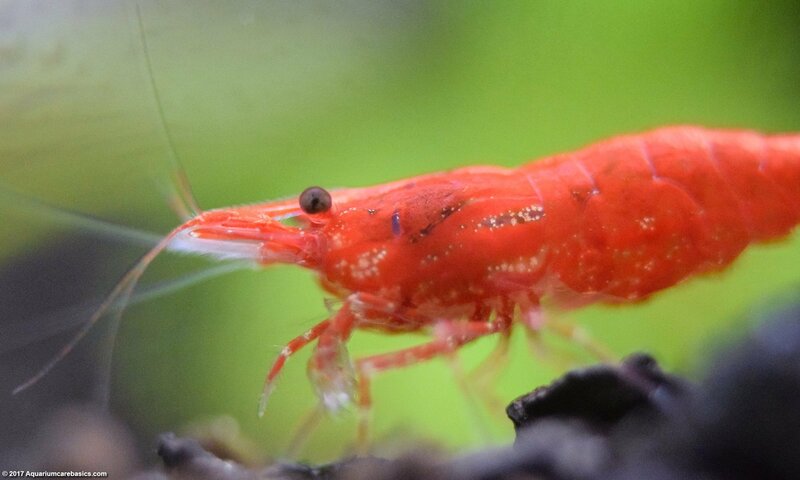 Red Cherry Shrimp are great scavengers that will help keep a tank clean of uneaten food and debris like Amano Shrimp and Nerite Snails do. But because of their small size, they really won’t consume as much as some of the larger “tank cleaners”. 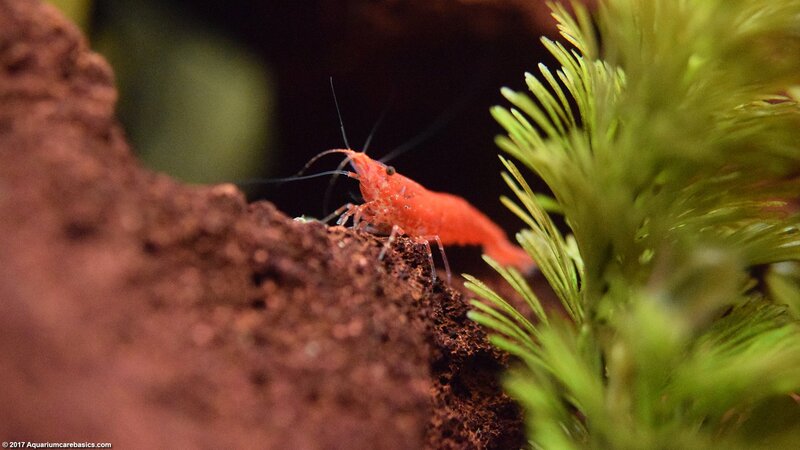 So do not think of these shrimp as tank cleaning miracle workers. Think of them as pets in their own right. 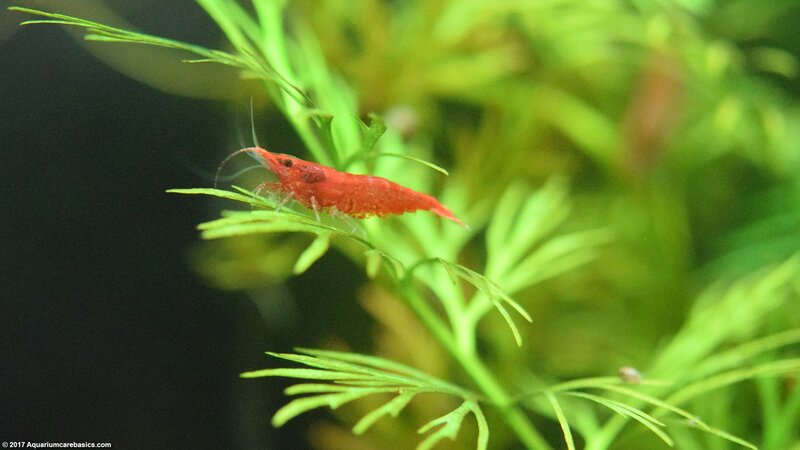 Keeping Cherry Shrimp, or other tank cleaning species is not a substitute for proper tank maintenance. A Red Cherry Shrimp tank setup can be any size tank provided the rules against overstocking are followed. The tank should include plenty of live aquarium plants. Its important for these shrimp to have lots of places to crawl on and explore. Live plants provide great hiding places and cover for these shrimp. Another value of a tank with live plants is that the tank is never “too clean”. Plants shed edible matter that will make its way into the water column and settle on hard surfaces for the shrimp to eat. 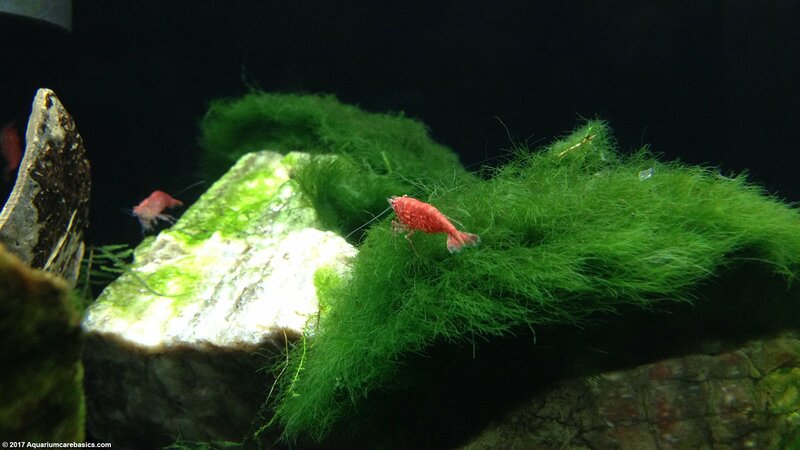 A Red Cherry Shrimp tank should also have a sponge filter. A sponge filter will trap little bits of food and the shrimp will spend hours picking it clean. Its also a good idea to keep an air stone in the tank pumping bubbles into the water to help keep the water moving properly. A good thing about Cherry Shrimp is that they will breed in a fresh water aquarium. 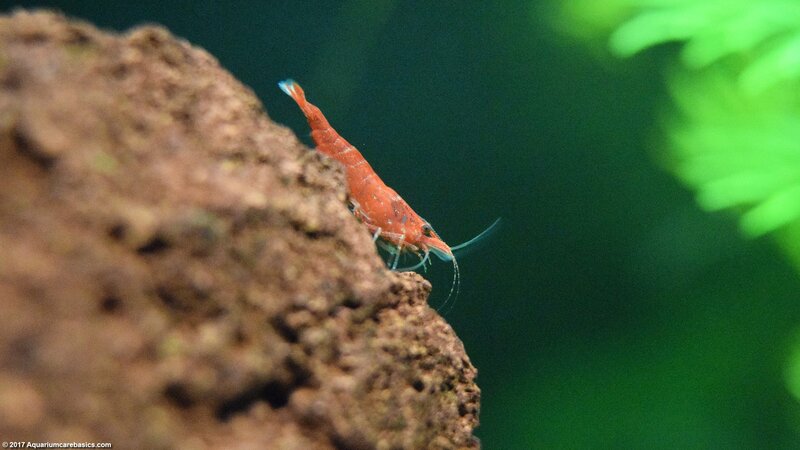 A female shrimp will carry her eggs under her tail, and that means she is “berried”. 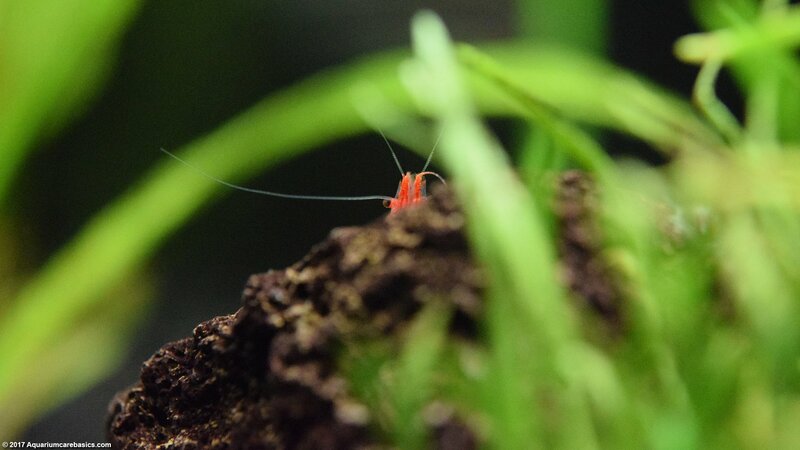 When a female shrimp is berried, its important to place a fine sponge pre-filter on power filter intakes to make sure that the baby shrimp do not get sucked up into the filter when the eggs hatch. 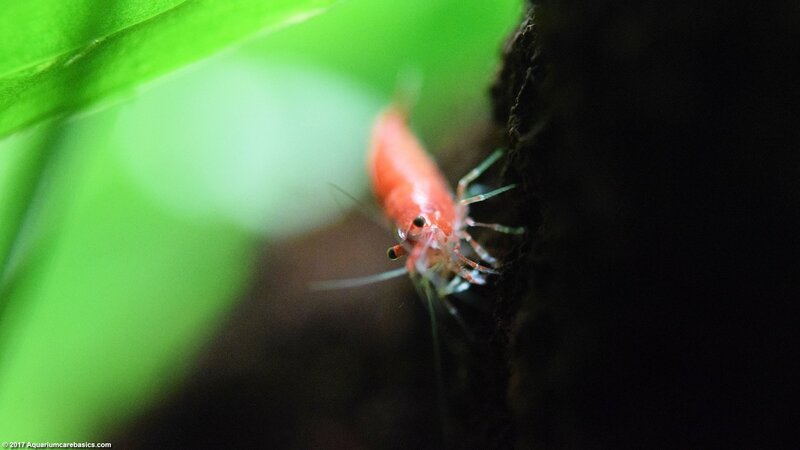 Its also a good idea to make sure there are many live plants that can grow fine dense leaves, like Anacharis, Cabomba or Water Sprite, so the baby shrimp have a place to hide as they grow. 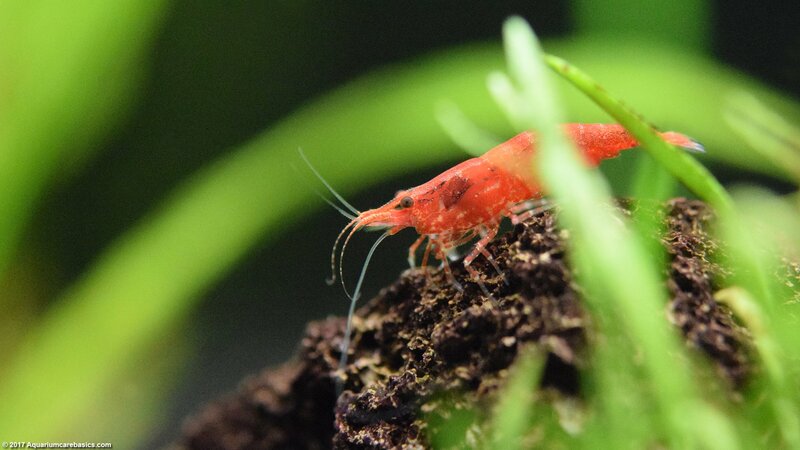 Red Cherry Shrimp have a peaceful and non-aggressive disposition, and have no real means to defend themselves. That’s why its important to choose tank mates closely. 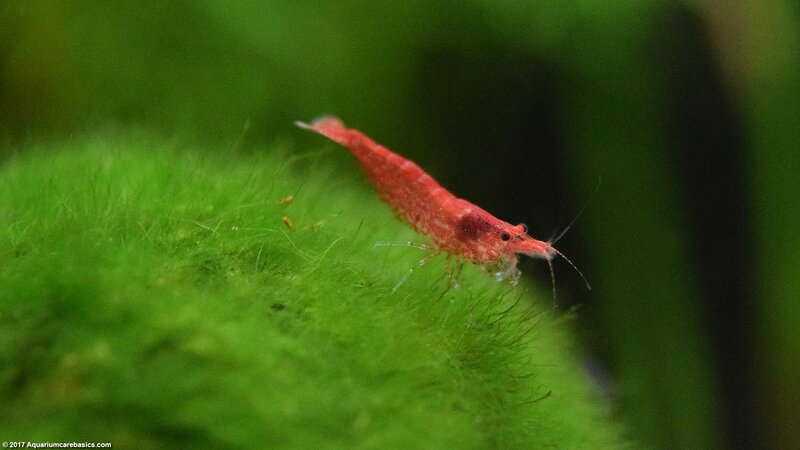 Red Cherry Shrimp can do very well in large or small groups with others of their kind. They can also do well with Amano Shrimp, small Ghost Shrimp, Bamboo Shrimp (aka Wood Shrimp) and Vampire Shrimp (aka Viper Shrimp). Freshwater snails like Nerite Snails, Gold Inca Snails, Ramshorn Snails, Ivory Snails, Malaysian Trumpet Snails, and Mystery Snails can also be a good fit as are Cory Catfish and Otocinclus Catfish.